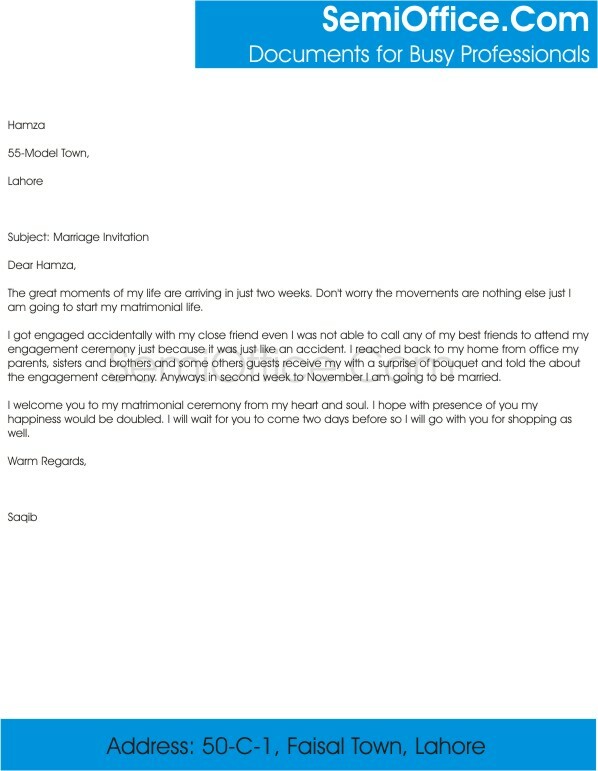 Sample invitation letter for marriage to friends. Marriage Invitation to Colleagues, coworkers, class fellows and close friends. Sample marriage invitation letter sample to invite boss, manager, president, CEO, chairman to your marriage ceremony with their families. You can send this letter in email or by postal services. I am writing this letter to break charming news to you that my elder brother John and his girlfriend Catherine are getting married, the next month. I know that you will be as excited by this news as I am. The date of marriage is 25th July. I invite you and your entire family to join us on this special day. I believe that you will give us the chance of hospitality on this special occasion. I am very happy to invite you to my wedding ceremony. It is going to held on 6th of this month at 12 pm. I warmly welcome you and your family to this ceremony. It would be an honor to have you and your family in my wedding ceremony. I am Mr. Amir Ali, working in your company since 2016. I am pleased to inform you that my marriage is going to be held on 25th April,2017 at Shahi Dera, Lahore. The timings for barat is at 7o’ clock in the evening. I would like to invite you along with your subordinates, cordially, to attend the ceremony. Let me avail an opportunity to make my day more special, if I would get a chance to share my happiness with my fellows including you. It will be an honour for me and my family, if you all will come and bless us with your warm wishes. I will look forward to welcome you wholeheartedly. The great moments of my life are arriving in just two weeks. Don’t worry the movements are nothing else just I am going to start my matrimonial life. I got engaged accidentally with my close friend even I was not able to call any of my best friends to attend my engagement ceremony just because it was just like an accident. I reached back to my home from office my parents, sisters and brothers and some other guests received me with a surprise of bouquet and told about the engagement ceremony. Anyways in second week to November I am going to be married. As you know my brother’s wedding is next month and you are invited along with your family. I have arranged a guest house for your stay. The dates are from 5th June to 8th June. As you have promised that you will manage some time and will attend the wedding so I expect you to fulfill it. Pay my regards to all family members at home. Looking forward for your arrival. Your brother’s marriage is going to take place next month. Your friend John lives in another city. Write a letter in not more than 180 words inviting your friend and his parents. I hope you and your family is doing well. I have amazing news to tell you. The news is that our brother Rory is getting married next month on the 28th in the winters. We all have been waiting for that day. All my family is very excited and I am sure yours will be too after knowing this news. Now what I and my whole family wants is that you along with your family come to our place for attending the wedding of brother Rory at least a few days before the wedding. We all will be waiting for all of you. Hope to see you soon friend. Say greetings from my side to all at home.